This picture was taken approximately between 3 and 5 in the afternoon on July 2nd with a older 35 millimeter camera with Bell&Howell made in Hong Kong. When I took the picture I was just trying to take a picture of the chemtrail going through because I was surprised to see that with all the cloud cover. This was taken at Mel's Marina on lake Sakajawea. This is one of the largest man made dams in the world. I hope this picture can be analyzed so we have an idea on what it is or isn't. Every time I see a ufo it is almost always different than what I saw before except the classic disc shape I saw three times now. I took this picture to show that they even spray on cloudy days which they never did earlier around here, and accidentally got this strange looking flying hat type of object! It becomes quite interesting once you start blowing it up and analyzing it! I thought for sure it was a bird but now I'm not so sure and I have been seeing ufos in the skies at night on occasion! We've received several emails with explanations for the image above. Some people have reacted with strong criticism, as if using the term "UFO" means "flying saucer." A UFO is a UFO... not a flying saucer. Is this a flying saucer? Who knows? 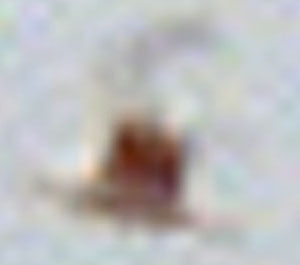 The photographer makes no claims (nor do we) that this is an alien space craft. It is, however, a very peculiar object in the sky captured on film. Explanations which have been sent in include a helicopter (I personally don't see that, nor was a helicopter heard by the photographer), and a bird. I looked carefully at the top hat UFO and think I have a good explanation. 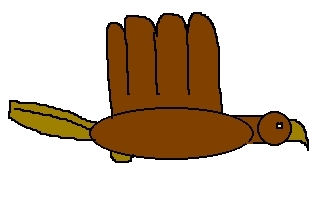 Look at the attached JPG of a bird with the wings in the down stroke wing position. I call the JPG a b-1-r-d. Kind of a joke, but I think that may be what that is. The vapor? Maybe some down feathers falling off the bird which are out of focus? I don't know. Is there really any way to know? 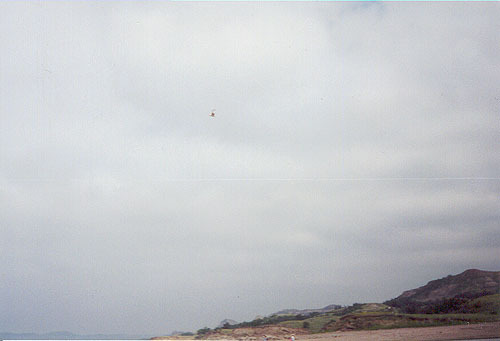 A New Analysis: More Than One UFO In Photo? I did some photo analysis on the picture with the UFO taken by the Chemtrail photographer. I found another object in the same picture. I built a quick page for it with all the information.